Guinness World Record attempt hangs in the balance – can you help? Support the event and volunteer. 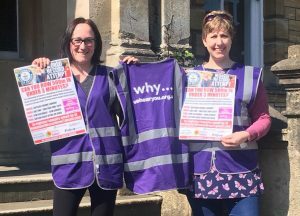 The team behind June’s rowathon world record attempt in aid of We Hear You is appealing for local people to sign up as stewards and witnesses for the event on 2nd and 3rd June. Without a full team of support staff, the challenge cannot go ahead. Organiser Rachel Clark says ‘We’re delighted with the number of people signing up to row and whilst we still need rowers we are confident we’ll get there – now we need to make sure we have enough people to make it run smoothly and ensure we follow the rules set by Guinness. Official witnesses for the rowathon world record are needed to sign up for a four-hour slot. This role is seated and involves keeping an eye on the rowers to ensure the rules of the challenge are followed, keeping a tally of numbers and counting the tokens that rowers drop into a collection box before they start. Official witnesses must be 18 or over and two people are needed per shift – a total of 12 witnesses. Stewards at the rowathon must be 16 or over and are asked to work a two-hour slot over the 24 hours. They will be responsible for registering rowers as they arrive, issuing the rowing tokens and managing the flow of people – a new rower will start every two to three minutes so the flow is speedy and constant! There must be two stewards on duty at a time, so another 24 people are needed. Volunteers can only cover one shift of either role under the rules and they’re not permitted to row, so the maximum time commitment would be two or four hours. People who can’t cover a whole slot but would like to volunteer are still encouraged to get in contact. All proceeds from the rowathon will go towards free professional counselling for anyone affected by cancer or a life-threatening condition across Somerset, BANES and Wiltshire. To sign up for the world record attempt as a steward or official witness, please email gemma.wilkes@wehearyou.org.uk. To register to row, please email fromeworldrecordrow@gmail.com with your full name, date of birth and preferred one-hour time slot.